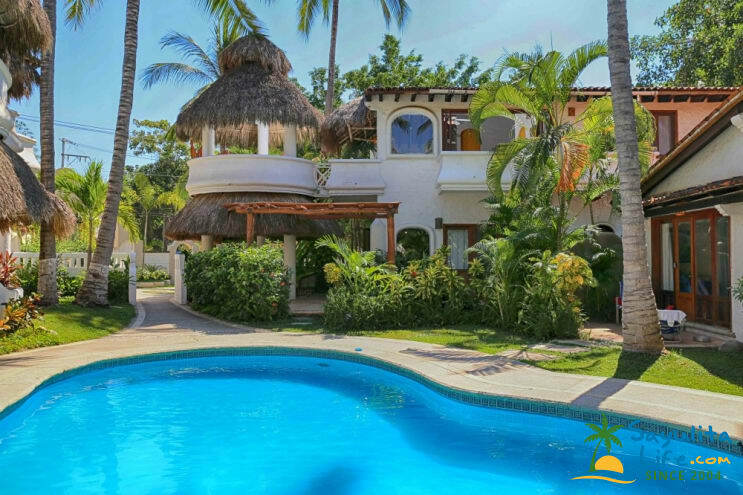 Casa de las Olas, (formerly Casa L Chaim), in Sayulita is fully furnished with a full kitchen, complete with FULL SIZE appliances, fully stocked cupboards with dishes, silverware and every gadget you could need to cook from your villa. 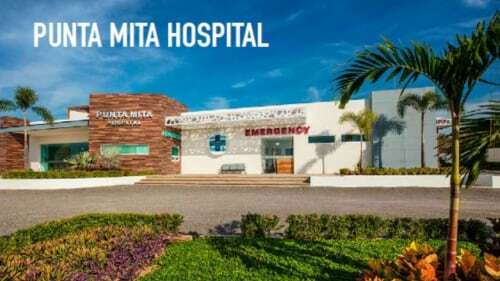 We have air conditioning, which is a real plus in Mexico! A spacious living room opens up on two sides to a walkout terrace that overlooks the beautifully manicured grounds, one of two pools onsite, and the Pacific Ocean. 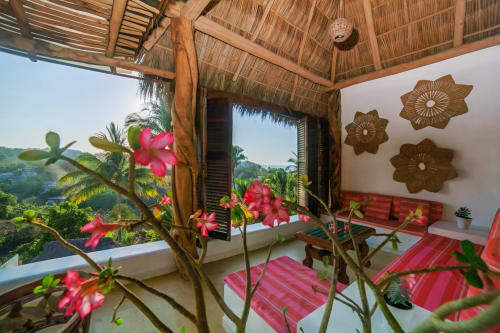 A palapa comes off the living room terrace to provide an extra place to kick back and relax. The living room comes with a TV, DVD player, VHS player, extra movies on hand to watch and games. 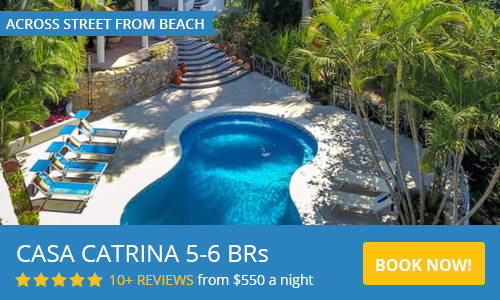 WiFi internet access is included in the rental price and cell phones can be reached here in Sayulita if you have international service. Casa de las Olas also has a full size washer and dryer and lots of extras like beach umbrellas, chairs, and even some sun hats to make lounging on the beach carefree and easy. There is a master suite with a king sized bed and a private bath, two more bedrooms, one with a queen sized bed, the second has two TWIN BEDS. There is a second full bathroom and each bedroom includes it s own private terrace and plenty of dresser/ closet clothing storage capacity. We appreciate the desire to spend time on the beach so in July of 2009 we replaced the beach furniture with new, adjustable chairs and a large, good quality beach umbrella. We also know that guests with children have more time to relax if their children are having fun so we also purchased some beach toys and boogie boards. At Casa de las Olas you are a 5 minute walk by beach or street to downtown Sayulita. The beach off the Los Delfines property is perfect for surfing and kayaking. There are two pools in the Los Delfines complex, a lounge area with chairs facing the beach area and BBQ grills that are shared by Los Delfines guests. The on-site management and maintenance make life easy at Casa de las Olas and maid service is included in the price of rental (maid service is everyday except Sunday or Mexican holidays). Our family of seven just returned from a stay at Casa L'Chaim over Holy Week of this year (2015). The casita was, as listed above, fully furnished with all we needed for our week long stay. With a few tweeks we made it "home" for our two year old grandson. Security was excellent even among the masses over the holiday. The downtown is an easy ten minute walk with good "eats" even closer. The beach is easily accessible with the pool right downstairs. Purified water is provided daily and with onsite management available to answer questions we felt very comfortable. The air conditioning was very valuable each night while fans kept us cool during the day. The elevated gazebo/deck was a very popular hangout all day into the night. Sayulita is a wonderful, close as we have been to authentic Mexican village...all a short walk away. We look forward already to our return to Casa L'Chaim and Sayulita! Ps...we would not choose to go again during Holy Week as Sayulita was overwhelmed with guests from inland at this time. Holy Week, we found out, is the most popular holiday to go to the beach in Mexico! Personal Checks and Chase Pay preferred. Rental is from Saturday to Saturday with check in at 3pm and check out at noon (exceptions are always considered per REQUEST). Reservation requires a 50% downpayment to save the week with the remainder due at least two months prior to the stay. Cancellation policy- Refund except $200 re-bookking fee for any CANCELLATIONS three months or greater prior to the stay, after that a refund only if we can re-rent the villa. Spend your next vacation in a relaxed atmosphere that feels more like a home than a resort. Casa de las Olas, (formerly Casa L Chaim), is one of 12 privately owned villa s or casa s that is part of the Los Delfines complex in Sayulita. A beautiful Oceanside property that is quiet and truly a paradise for rent . Need more room? Please check out two additional homes Villas los Delfines, located on the same property.